Social Network Analysis (SNA) is an established discipline for the study of groups of individuals with applications in several areas, like economics, information science, organizational studies and psychology. In the last fifteen years the exponential growth of online Social Network Sites (SNSs) , like Facebook, QQ and Twitter has provided a new challenging application context for SNA methods. However, with respect to traditional SNA application domains these systems are characterized by very large volumes of data, and this has recently led to the development of parallel network analysis algorithms and libraries. 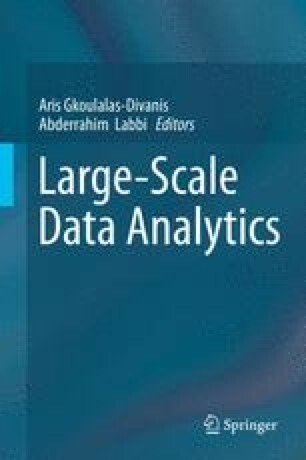 In this chapter we provide an overview of the state of the art in the field of large scale social network analysis; in particular, we focus on parallel algorithms and libraries for the computation of network centrality metrics. This work has been partially funded by PRIN project “Relazioni sociali e identità in rete: vissuti e narrazioni degli italiani nei siti di social network” and by FIRB project “Information monitoring, propagation analysis and community detection in Social Network Sites”. This work was done while M. Magnani and C. Paolino were with the Deptartment of Computer Science, University of Bologna. The authors thank the CINECA supercomputing center for providing access to the IBM pSeries 575 used for part of the tests described in Sect. 6.6.